Well kids, I have now joined the ranks of the unemployed. I'm not out on the street yet, but I do have to be much more conscious about how much money I am spending on food, and I don't want to waste any of the food I buy. The up side (if you can call it that) is that I have been inspired to start using all of those impulse purchases that have been coming home with me in the past few years. In life as well as in business, it seems the more money you have the less aware you tend to be of where it is going, and I had gotten into the unfortunate habit of seeing something interesting on the grocery store shelf, thinking "Oh, I'd like to make something someday with that," throwing it into my basket, and taking it home with me. But those days are over, at least for now. I'm putting myself on a food budget. I'm determined to keep it healthy, tasty, and inexpensive, while staying as true to my non-processed, local and organic principles as possible. That will be most difficult with regular milk, eggs, and meat, since they are so much less expensive than the non-organic, non-free range, antibiotic-filled brands to which I have gotten used. I do still plan to take full advantage of the green market. I just need to curb my impulse to buy so much more than I can possibly use in one week, and stick to the produce. It starts this week and I'm already dreaming about baby greens, asparagus, strawberries, fresh garlic, and sugar snap peas. I first wrote about Greek Lentil Soup and posted the recipe back in November of 2005, when this was still a knitting blog and I had just started to write about food. I used the beluga lentils back then, but it works just as well with the regular brown lentils you get in the beans and rice aisle of your local grocery store, and they are less expensive. This is a deceptively simple recipe that is super delicious. The lemon juice really brightens up the flavor and takes it over the top. It freezes well, which is a good thing because it makes a lot. I always freeze half of it immediately, so I'm really getting two dishes out of one. And here's a tip that will help spread your dollars that little bit more. I started doing this before I became budget conscious. It's even better now that I'm trying to save wherever I can. Use two-thirds to half of the amount of prepared liquid (chicken broth, vegetable broth, drained liquid from canned tomatoes, etc.) called for in a recipe. Make up the balance with water. I started this practice years ago when I made pork chops with Spanish Rice (something I haven't written about yet because after years of making it perfectly back in Austin, I can't get it right up here, but I'm working on it) and used the liquid from the canned tomatoes for the rice. There wasn't as much as I needed so I got in the habit of combining it with water to get the proper amount. And I find most brands of prepared vegetable broth to be overpoweringly strong so it just made sense to me to thin it out a little so it wouldn't take over the dish. That translated pretty quickly to chicken broth as well. Even when it's homemade, which I try to have on hand more often than not, I've gotten in the habit of thawing out less than I need and making up the difference with the water. A new habit of mine (which is quickly becoming an obsession, I must confess) is to tally up the cost of my budget-conscious dishes. I want to see if what I think of as economical really is as cheap as I think it will be. I will share those results with you. At $1.98 a serving, this is a truly inexpensive meal. 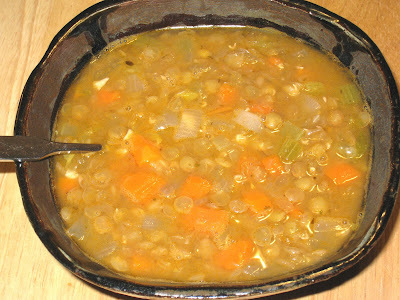 Place lentils in large soup pot with broth and bring to a boil. Reduce heat and simmer 1 hour, or until tender. Add onions, carrots, celery, garlic, tomato sauce, olive oil, oregano and salt and pepper to taste. Cook for 30 mins longer, or until soup is slightly thickened.